No security X-ray system has yet been produced that can make autonomous decisions for acceptable and reliable threat detection. All still heavily depend on human operators to view and interpret the images. It is vital that you understand, the limitations, as well as advantages, of X-ray as a security tool, in order to minimise possible problems and allow you to overcome them. A threat item in a bag will always be harder to identify if it is rotated (seen at an unusual angle). Because we cannot predict how terrorists will conceal/position weapons and IEDs, screeners need to be trained to recognise threat items from all viewpoints. A screener may find it relatively easy to identify large, predictable threats like guns and larger knives viewed in familiar side profile – but if the weapon is viewed from above or from its end, it will be far more difficult to identify. A best case scenario for the X-ray screener is a revolver that is lying on its side so that its shape is obvious. The same is true for a knife of substantial size if it is lying on its flat side. What becomes difficult, and where most operator training and judgment come into play, is when a weapon is in a different orientation so that it is viewed from the top, bottom, or back of the weapon. A revolver will generally still have a revolver shape that reveals its cartridge. An automatic weapon viewed from the top, however, will produce an image that is an innocuous rectangle 4 inches or more in length. (Keep in mind that there are some weapons available today such that the length is less than 2 inches.) An automatic or semi automatic weapon viewed from the back is an even smaller rectangle. And, unfortunately, a knife can be very difficult to detect if it is viewed from above or from its end, or if it is made of any material other than metal. And x-ray screeners aren’t just looking for more easily recognisable guns and large knives. Since the 9/11 attacks, even objects such nail scissors, razor blades, cigarette lighters, plastic knives and liquids are classified as potential threats by many airports. Identifying explosives with x-ray is even more difficult than detecting weapons, because explosives do not have defined, predictable forms. They can be liquid or gas, or solid in any shape or size. Positioning of the bag is important, as it effects the orientation of the item to be screened in relation to the x-ray beam (which can be positioned for horizontal beam or vertical beam, depending on type of machine). Do not initially put a bag down on a conveyer belt such that the images captured will be of the narrowest perspective of the bag. Position the bag on its widest side to allow the x rays to penetrate the least amount of material. If items within a bag cannot be seen clearly, the bag should always be repositioned. Changing the orientation of an object can produce a clearer profile, changing shapes, density and the overall appearance. Even if time is limited, an item should be examined from at least one additional angle, for example at 90 degrees from the angle of the original presentation of the bag. If the bags on an X-ray machine are too closely spaced, the images will pass through too quickly. It is also important to allow sufficient distance between the bags when loading the conveyer belt, so that the images of two bags do not overlap, resulting in a combined image. The intensity in an x-ray image is proportional to the number of x-ray photons that pass through objects on their way from the source to the receptor. Since different materials have different transparency properties, the intensity of an x-ray image depends on both the thickness and the type of material between the source and the receptor. Moreover, any x-ray photon that is not absorbed by one object on its path may be absorbed by another. Thus, a thick layer of semi-transparent material can have the same effect on the image receptor as a thin layer of opaque material. X-ray opaque objects and areas the X-ray is unable to penetrate will produce black areas in the image and such areas are referred to as “X-ray Opaque”. Thick metals, crystal, and some types of glass, e.g. camera lenses, which include special lead compounds added to the glass will also be opaque. Any bag with an X-ray opaque area should be hand-searched and then rescanned once the item has been removed. It must be understood that an opaque area not only prevents information on articles behind the area from being presented to the operator, but also information about articles in front of it. This is because the absorption of the X-ray beam is such that the information on the bag’s contents for the entire line of the beam is affected. Even where very small opaque areas overlap an organic mass, the X-ray operator should consider whether such an area might shield the components of an IED. When in doubt about an object or area in a bag, investigate! The number of bags being screened and the various colours and shapes on each bag can make it very difficult to identify a weapon or explosive device among the clutter of gadgets, clothes and personal articles passengers carry. A range of variables affect the difficulty of identifying items within a bag. The number and dispersal of objects, clutterdispersal of density, bag type and size; and handles, buckles, metal frames and wheels on the bags will complicate the image. A cluttered x-ray image sometimes contains so much stimuli and visual information that the screener may become overloaded. 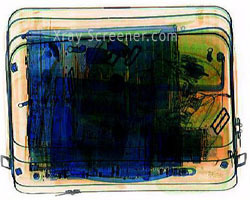 The screener should make use of the various image enhancement features of the X-ray machine to help decipher the image. If explosives or weapons are present in a packed bag they will almost certainly be partially or completely obscured by denser innocuous objects. More often than not, clutter is the cause of manual searches. Bags vary in terms of the electrical items they contain, but special attention must be paid to electrical items since their complexity and numerous components may be used to hide prohibited or threat items. Items should be removed from the packed bag and screened separately. Electrical and electronic items which might conceal a weapon or explosive, such as shavers, calculators, radios, clocks, cameras, personal stereos and their cassettes, etc, should be closely examined to ensure they have not been tampered with. Individual items should be X-rayed, to ensure there are no unusual components, additional power sources, or organic material within what should be an inorganic shell. The owner can also be asked to switch-on items like laptop computers. Out of Gauge Bags are ones that cannot be processed through the standard X-ray machine because of their size, weight or shape. In this case they must either go through a larger machine or be searched by hand. It is useful to support this process with analysis using explosive trace detection equipment, if this is available. All child-related equipment, including strollers, umbrella strollers, baby carriers, car and booster seats, backpacks, and baby slings, that does not fit through the X-ray machine should be visually and physically inspected. Expediting the screening process, people should be asked to collapse or fold child-related equipment when they arrive at your checkpoint. Surprisingly, large band instruments such as guitars can usually be put through an x-ray machine successfully; the normal thinness of the metal of most instruments will allow the x-ray detector to see within and behind the instrument for any hidden threats. Previous Article: What are X-Rays?